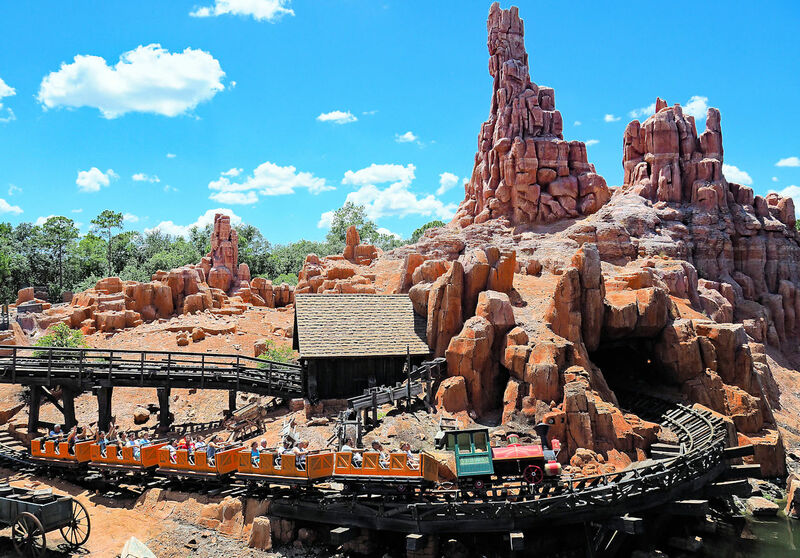 In this article we give an overview of Big Thunder Mountain Railroad Backwards (going backwards). This overview of the attraction going backwards focuses on the ride in the Magic Kingdom at Walt Disney World in Bay Lake/Orlando, Florida, however, most of the information here can apply to the other rides at the other Disney Parks. In the following paragraphs you will learn if Big Thunder Mountain Railroad is operated backwards or can go backwards. Also you can view videos that show the ride going back backwards or looking backwards. Does Big Thunder Mountain Railroad go backwards? No. We have not seen the attraction operated backwards before and do not believe it can be operated backwards. Why can’t Big Thunder Mountain Railroad be operated backwards? The tracks and lifts are set up to go in the forward direction. We do not believe the lifts, the inclines where the train goes up, can be reversed so the train can operate in the opposite direction, without major modifications. Above is a photo of Big Thunder Mountain Railroad operating forward and not backwards at Walt Disney World's Magic Kingdom in Florida. Original photo by Frank Phillips on Flickr. The above photo was modified by NavFile. Photo is released under a Creative Commons Attribution 2.0 Generic License. Even though the ride can not be operated backwards, there are videos of Big Thunder Mountain Railroad “going backwards”. Individuals and organizations have picked up on the interest in Big Thunder Mountain Railroad going backwards at the Magic Kingdom. In order to show the ride going in reverse, they have reversed their footage of the ride to make it look like it is going backwards. The videos of Big Thunder Mountain Railroad in reverse can give you an idea of how the ride would look like if it were operated backwards. Another area of interest regarding the backwards version of the ride is what the ride looks like if you were facing backwards. We have also added some of those videos to our backwards YouTube playlist. Below we have put together some of the best videos of the Big Thunder Mountain Railroad attraction going backwards at Walt Disney World’s Magic Kingdom (Frontierland). The first two videos show Big Thunder Mountain Railroad in reverse by reversing the video footage. Video 3 showcases what the roller coaster looks like if you were facing backwards. Were does the interest in Big Thunder Mountain Railroad operating backwards come from? Were are not 100 percent sure, however, we believe there is another train roller coaster that runs backwards at a different park. Also, Expedition Everest in the Animal Kingdom does go backwards for a portion of the ride, so that could be an explanation for the interest. Some may also want to see what the ride looks like if it were to run backwards. To learn more about Big Thunder Mountain Railroad, Magic Kingdom, Walt Disney World Resort, Bay Lake, Florida (Orlando area), visit our other pages about the ride.